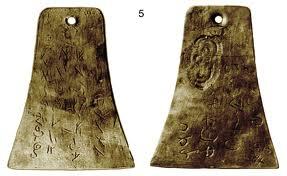 The Kinderhook Plates were six brass, bell-shaped plates covered with engravings that were shown the Prophet Joseph Smith in April, 1843 while he was living in Nauvoo, Illinois. Because he was known for having translated the Book of Mormon from gold plates, and the Book of Abraham from ancient papyri, some locals decided to test him by forging these plates and tricking him into translating them. When the plates appeared, many in Nauvoo were quite excited about them. Some supposed they were further plates like those that produced the Book of Mormon. The plates were supposedly found by a Mister Robert Wiley on his farm in Kinderhook, Pike County, Illinois. The plates were cleaned and taken to Nauvoo by a W.P. Harris who shared news of the discovery with the eager Mormons in Nauvoo. No direct statement from the Prophet Joseph Smith exists for what he thought of them. A few references in the newspapers and journals of other Nauvoo residents seem to indicate that the Prophet considered them to be genuine ancient artifacts. However, he made no attempt to study or translate the plates and soon the incident was largely forgotten. Many years later, one of the men who forged the plates admitted to the hoax. They had planned to humiliate the Mormon Prophet by revealing the forgery after he translated them, but their plans were frustrated as Joseph made no attempt. In the early twentieth century, one of the plates was found. It was subjected to inconclusive tests by the Chicago Historical Society in 1920. In 1980, the plate was subjected to further tests showing that it was indeed a nineteenth century hoax. Many anti-Mormon writers have attempted to use this incident to show that Mormonism was false, since the Mormon Prophet was supposedly tricked by such a juvenile hoax. However, since Joseph Smith did not fall for the bait and never attempted anything beyond saying they appeared genuine, and even that statement appears only in someone else’s memoirs many years later, this incident proves nothing and has been cited by many to confirm that Joseph Smith was a prophet, since he was not tricked and never tried to translate them. This page was last edited on 30 August 2011, at 10:30.